Alarm and wake-up call insured I was ready to go. I had a clean-up of my belongings and had a good pack. My pack now weighs about 7.5 and I think on the Camino it was about 7 kgs. It saw some strange things. Most packs seemed very heavy. One person had a dressing gown, another an electric shaver. The trip back to Charles de Gaulle was fine. Then problems, big problems. When I went to check I was asked if I had a visa or esta to the USA. I said no, I was not staying in the Unites States, I was just transiting there. The reply was 'Sorry, It doesn't matter, you STILL need a visa or an esta. We cannot process your outward journey unless you do that!' So across to a service desk and the long process of getting an esta to transit in the States. The Computer at the service desk hardly worked, every time I pressed extra hard the same letter would come up twice. A lot of Hail Mary's! It cost me $14 US. The payment also had to be done on the Computer, which also was difficult. Then back to the Air France desk. It did not come up on their screen. A lot more Hail Mary's! I was now desperate, both in terms of time, and the fact that I might be stuck here. Finally it came through. Through customs and into the Departure Lounge. I had made it. The plane took off an hour late. I am told it is a 12 hour flight. I watched the Steve Jobs movie. OK. Any movie, not great. A long time in a plane. Finally arrived in Los Angeles with a bumpy touch down. I had thought that being 'in transit' would be a simple business of joining other passengers who had been through custom formalities and were waiting for their plane to leave and that my small pack was being sent to the Air New Zealand plane and that I would not see it until Auckland. Dreams are free! I still had to go through customs and immigration like everyone else, pick up my baggage from the carousal, then take the pack to a service desk where it was then sent to the airline. The strange thing in all of this was that it never actually went through a scanner. At immigration I was fingerprinted and photographed, along with everyone else. I finished up in the arrivals exit along with everyone else. In fact, at least in terms of where the Air New Zealand terminal is, there really is no Transit Lounge as such. The whole business really was quite time consuming and tiring. It kind of puts one off in 'transiting' through the States. Los Angeles is 9 hours behind Spain and France and 21 hours behind New Zealand. I had arrived here 1.30 pm Los Angeles time and leave 9.15 pm Los Angeles time, arriving in Auckland 7am New Zealand time. Hope you have enjoyed reading this. It was good to wake up for a 2nd day knowing that my walking days were over. The day began drizzling, wet and cold, but later turned into quite a nice day. I had an appointment at the University with Ivar Rekve. He runs an internet site of the Camino and also collects and stores parcels for those on the Camino. I picked up a small parcel of clothes from him which I had posted from NZ. It only cost 10 Euro. It's been interesting with my clothes. I decided to stay with my walking boots today as they give greater stability on the rough surface of the streets. I have gotten used to my evening pants so it was hard to exchange them for a new pair. It was good to wear a shirt again and other new things. Next to the Travel Agent to arrange to get to Charles de Gaulle tomorrow. There were 3 options; to fly to Orly via Madrid and then an hours bus or train to Charles de Gaulle, another involving beginning from another airport, and a quite expensive flight direct to Charles de Gaulle. Only the 1st really suited. When I spoke to the Tourist Information Office originally they gave me 3 good places to go to, but, today being a Monday, some of them were closed so I needed to revise my plans. I began with the Cathedral. I had a good look this time and also got to go to Reconciliation, which I saw as part of my pilgrimage. In order to get a feel for the sheer size of Santiago Cathedral one has to walk around it a few times and look at it from all different directions, it has four façades overlooking four elegant squares, multiple entrances, a cloister, a museum, a library, four main towers (and a few other smaller ones) and the biggest incense burner in the world! The inside of the cathedral is in the shape of a crucifix with the longest part pointing west. Each of the extremities of the crucifix has an entrance and a distinctive façade. Maestro Mateo was the man in charge of the renovation of Santiago Cathedral starting in 1168, after it had been mostly destroyed by years of neglect and Muslim attacks, he was also responsible for the Pórtico de la Gloria. Little is know about his life. He is believed to have worked on several other buildings along the Caminos, especially in France. The detail present in the carvings of the musical instruments held by the twenty-four Elders of the Apocalypse lead us to assume that he possessed a detailed knowledge of the musical instruments of the time. Entering from Praza do Obradoiro, the large windows in the 18th century outer façade allow the evening light to fall on the original 12th century Romanesque façade, the Pórtico de la Gloria. It was to protect this from the elements that the 18th century façade was added. The Pórtico de la Gloria is a masterpiece of Romanesque sculpture and a disturbing depiction of the apocalyptic vision at the heart of Christianity. Both the saved and the damned are represented. On the central column, sitting in judgement on a throne, is Jesus and below him St James as his messenger. On either side the 24 elders of the Apocalypse holding musical instruments, and a pantheon of apostles, angels and saints and personages from the old and new testament from Adam and Eve onwards. Below them the damned; Jews, non-believers and sinners. Pilgrims arriving here traditionally touch the foot of the central column which is worn away from centuries of hands. There is a huge incense burner - the Botofumeiro - which is swung from the central nave at the end of the pilgrim mass. Its original function, besides symbolizing prayers ascending to God, was to mask the smell of the great unwashed masses who assembled here having walked from all over Europe. It weighs 80kg. The Cruz dos Farrapos is where pilgrims used to hang the tattered clothes they'd worn on their long march. Next I visited the Cathedral Museum. Entrance to the museum also includes the library where the original of the Codex Calixtinus is kept, the Botafumeiro, the Renaissance cloister, the crypt of the Pórtico de la Gloria and the Treasury and Chapel of Relics. The museum houses many examples of Maestro Mateo's work including a model and partial reconstruction of his original choir, which occupied part of the main nave, until it collapsed in 1603, pieces of which were reused in the construction of the Holy Door. There are also collections of coins, a banner used at the Battle of Lepanto, tapestries and many other historic items. Finally, I went to what is known as the Hospital Real, built by Church leaders as a pilgrim hostel and opened in 1509. Sadly. (For me) it's now a luxury 5Star hotel. Pilgrims arriving on foot were allowed to sleep and eat there for three days. It also provided medical assistance to the sick and sometimes served as an orphanage. But the hotel does still serve pilgrims in a way. I was able to walk around the inside of the original hospital. Also, there are free meals for pilgrims, served from the staff quarters. After this, a nice meal and a little shopping. Then onto this diary and photos. I took things easy last night, resting my feet, not going out for a meal, but finishing off some food that I still had on me. Today I slept in until 8.15am! It's very quiet. Normally there are quite a few buses to Santiago, but because it is Sunday the 1st one is 11.45am. I spent part of the morning at the foreshore watching the fishing fleet and admiring the scenery. The bus trip is 3 hours. Instead of going over the hill as I had yesterday, the bus trip is around many beautiful bays. Roads are pretty tight. Because I have walked such a lot, I get to feel that cars and buses go very fast. Now I was on the other side, admiring the bus getting around corners etc. I am sure I will be a more careful driver as a result of all this! I arrived at the bus station about 3pm. There was the chance to have a meal there. Then an easy walk to the 'old city.' I enjoyed the inexpensive hotel I had been in previously so booked in for another 2 nights. My iPhone remembered the password immediately. Over a month ago I posted a parcel of clothes over so checked out where to pick them up tomorrow. Then a look around the old city, especially the Cathedral. Although I had missed the normal pilgrims Mass this morning, there was an evening Mass which I attended. There are many special things about this Cathedral, which I will talk about after I visit it tomorrow. I think Burgos Cathedral has so much artistry over many many years, and Leon is one style and quite beautiful because of that. I think Santiago has more of an historical connection, with St James and the Camino itself. Although the day has been fine, it began to lightly rain early evening, and then it became very windy, rainy, and I thought I may have heard thunder, so I have decided not to worry about food tonight and stay indoors. Today we started out mostly wet. I had managed to dry my pants but that was about all. Wet boots soon made wet socks also. The trip began up hill, past huge wind mills and above a reservoir. It was hard going. There was a bar at O Logoso, which advertised that it was the last bar for 15 kms. Shortly after this is a place called Hospital, where there was once a hop total for pilgrims. Shortly after this the road divides, the left going to Muxia. So Hospital, Finnestere and Muxia form a sort of triangle and some go on the Muxia as well. I am not doing this as Muxia has no meaning in terms of the Camino for me, quite apart from time constraints. For many pilgrims coming from landlocked countries like Germantown and Switzerland, this would have been their 1st experience of the sea ever. Getting done from the heights to Cee below was really hard and seemed to take ages. Finally I was down. Cee is beautiful, reminding me of Oriental Bay, Seaton and Eastbourne. I really needed to spend sometime here, it was so beautiful. Then on to Corcubeon, which is really an extension of Cee. This is an idyllic seaside resort. Just a livery place. The weather was also friendly, with just the hint of rain, but it never really came. Then the final 12 kms to Finnesterre. Sometimes around bay's and sometimes over small hills. Finally I was there. I had arrived. My feet were sore and I was having trouble walking on them. I had walked 764 kms from St Jean Pied de Port to Santiago and from Santiago to Finnesterre 90 kms. It will be good to rest tomorrow. Today, like the last few days, has been on and off rain, with a bit of hail thrown in as well. It was slow going this morning. I met a new man Valentino from Germany. He started his Camino a day before me. 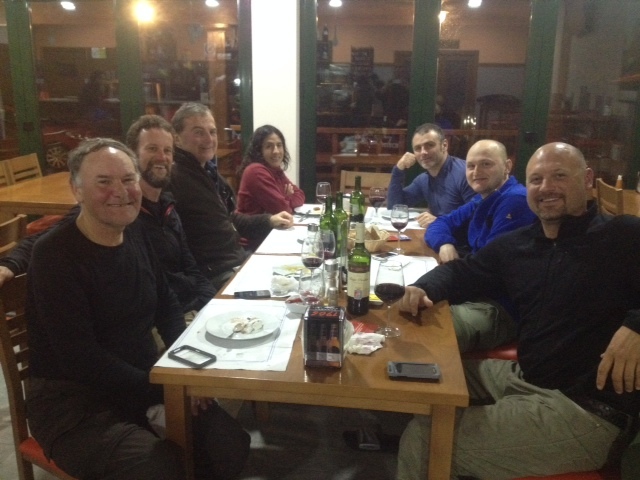 After 12 kms, at the bar at Vilaserio, I met up with Valentino, Will and Wayne, and Mel and Sophia. So with 12kms done, it was getting on for 12.30pm and we still had 23 kms to go. Progress was slow. I teamed up with Mel and Sophia. We had an enjoyable time walking along but I suspect in talking as we did, our progress was slower. Then we struck trouble. It started with a way marker fallen over on its side, so we simply had no idea where it was pointing! It meant walking both routes to see if there were other way markers. There was one to the right but it was pointing in the opposite direction, to Santiago rather than Finnesterre. The only way was to backtrack and start again further down the line. In reading a commentary afterwards it seemed that there were 2 routes - a summer and a winter one, and we had somehow got tangled between the two. We eventually made it in pouring weather, arriving at Olverroa absolutely soaking at about 7.30pm. The albergue didn't really have any warming clothes facilities apart from small bar heaters. After attempting to dry ourselves, we went across to the restaurant 100 metres away and got soaked again in the process. The meal was great. I left about 9.30pm for a good nights sleep in the aubergie. I didn't set the alarm and woke up about 7.30am. My room is on the 4th floor with a window to the sky. It has a sloping roof and I managed to hit my head against it. So there are many ways of getting injured on this Camino! There was breakfast provided, but I am moving slowly. I have a slight blister which is not too much of a problem. I left about 10am, which is my latest start. I justified it on the grounds that today is a relatively short day on the Camino. Went back to the Cathedral and took a photo. I'll take more when I return in 3 days. It was a bit hard finding the Cathedral, and then the signs from there to Finnisterre. I meet a group of possibly Japanese tourists whose guide must have told them about the Camino, so I waved to them and they to me. I met a South Korean young man who had just finished the Camino (I'm not sure if it was the long or short version.). He went out of his way to get me started. The path weaves it's way through the streets of Santiago. No farmhouses this time, but perhaps some weather homes. Then the Camino made slow progress into the hills. Along creek beds mostly. Relatively dangerous. Certainly one needed to be careful. In an hour I only travelled less than 2 kms, or so it seemed. I decided it might be better to follow the road for a while. Certainly I was able to increase my pace. I stopped at 2 cafe / bars along the way. I also had a couple of oranges and apples to keep me going. Finally I arrived at Negreira, my 1st stop on this 3 day final journey to the (then) 'end of the earth.' I also met Christopher as I arrived, our 1st meeting in about a week. Just a word about Finnestere. It was the end of the known world until Columbus altered things and was the final destination of many pilgrims who made the journey to Santiago many years ago and I think the symbolism is of cleansing and beginning life anew. Finisterre (“Fisterra” in Galician) was the end of the known world until Columbus altered things and was the final destination of many of the pilgrims who made the journey to Santiago in centuries gone by. There are various explanations as to how this continuation came about (one such is that it was based on a pre-Christian route to the pagan temple of Ara Solis in Finisterre, erected to honour the sun) but it is also known that a pilgrim infrastructure existed, with “hospitals” in Bon Xesús, Cée, Corcubión, Finisterre itself and elsewhere. There are also several Jacobean and other pilgrim references along the way. A cruceiro with a figure of Santiago in the village of Trasmonte, for example, the church of Santiago in Olveiroa, with a statue of St. James inside as well as on the tympanum outside, probable pilgrim hospital in the place of that name (apart from those already mentioned in Cée and Corcubión), the church of Santiago at Ameixenda, 2km south of Cée with a relic reputed to be of one of St. James’ fingers, a large statue of San Roque in pilgrim gear in the church of San Marcos in Corcubión, a statue of St. James in the church of Santa María das Areas in Finisterre with a cemetery chapel that formerly belonged to its pilgrim hospital and two references to San Roque in place names: the Encrucijada or Alto de San Roque at the top of the hill leaving Corcubión and the San Roque area at the entrance to Finisterre. Then, 3km from Muxía, on the route direct from Hospital, you pass the Capilla San Roque, with a statue of San Roque Peregrino inside, with a wound on his right leg, an angel/child and dog at his feet, a stick and wearing a pilgrim hat with a scallop shell on it. After pilgrim accounts of their journeys along the Camino francés the route that those in the past most frequently wrote about was the continuation to Finisterre - Muxia. These came from various European countries and were in several different languages, including the 17th c. Italian Domenico Laffi, four times a pilgrim to Santiago, who describes his visit to the church of Santa María das Areas, 2km before the “end of the earth” itself. Continuing to the coast on foot is definitely worth the effort. Finisterre is the real end of the journey, both in the physical sense and in the religious and historical one. You will pass a number of interesting small churches, pazos (large Galician country houses), fountains, cruceiros (wayside crosses) and old bridges along the way, apart from (if you have already walked to Santiago) the now familiar hórreos (raised granaries, frequently very long), as well as (in season) a lot of very large, very bright blue hydrangeas, and the scenery is often beautiful. It is a very peaceful route and, as there are still relatively few walkers, the route is quite different from the often motorway-like Camino francés before Santiago in July and August. It does rain a lot in this part of Spain, of course, and it is often misty in the mornings, but on the walk to Finisterre (and especially if you continue on to Muxía), you will have the opportunity to see something of the real Galicia, away from the big towns. How long does it take? Allow at least three days, preferably four, to walk to Finisterre, with possibile overnight stops in Negreira, Olveiroa, either Cée or Corcubión and Finisterre itself, plus a day for the (recommended) continuation to Muxía. The actual walking is not hard but there are a lot of climbs and descents. Waymarking The route is waymarked with the familiar yellow arrows and they lead you from the first one by the Carballeira de San Lourenzo in Santiago, all the way to Finisterre/Muxía. The route is also marked with concrete bollards with both the blue and yellow stylised ceramic shell familiar from parts of other caminos (and whose rays normally indicate the direction you should take). Many of these marker stones also give the distance remaining to Finisterre while others show the number of kilometres still to go to Muxía. Maps Some maps are available in Santiago bookshops, such as the 1:250.000 map of Galicia (published by the Xunta de Galicia) and the relevant sheets (hojas) of the IGN’s 1:25.000 series of the Mapa Topográfico Nacional de España: 94-IV (Santiago), 94-III (Negreira), 94-I (A Baña), 93-II (Mazaricos), 93-I (Brens), 92-II (Corcubión) and 92-IV (Fisterra). For the Finisterre-Muxía section you will need 67-IV (Touriñan) and 67-II (Muxía) (hojas 93-1, 93-2 and 92-2). The Xunta de Galicia’s booklet Camino de Santiago en Galicia: Camino de Fisterra-Muxía (with versions in Castilian, Gallego or English) gives historical and other information but only very brief route-finding information, and is available from their tourist office (not the municipal one) in the Rúa do Vilar in Santiago, near the cathedral. Route description The route-finding information given in this guide is not divided into daily stages but runs continuously, thus enabling the pilgrim to cover the distances he or she prefers each day. Each section begins with the distance walked from the previous one and, before giving directions for walking that part of the route, provides a description of any practical facilities such as shops, bars, restaurants and accommmodation, and brief details of churches and other monuments of particular interest. Place names appear in the text in bold type. Abbreviations have been kept to a minimum: CD = cash dispenser, CT = camino de tierra (earth road), FB = footbridge, FP = footpath, KSO = keep straight on, KSO(R) or KSO(L) = KSO on road that veers/turns that way, L = left, R = right, rte – restaurant, // = parallel to, > = becomes. Spellings of place names may vary: in Galician on signposts, for example, and/or in Castilian on maps. (This applies particularly to places beginning with or including b or v, e.g. Baosilveiro/Baosilbeiro/Vaosilveiro.) If versions given in this guide appear inconsistent at times, this is because they are based on those seen on street and place-name boards and signposts encountered along the way, not on those found on maps or in other guide books (and for this reason the Galician term is often the one provided). Glossary The following short list may come in useful: aldea = hamlet, Casa do Concello = town hall, corredoira = walled lane, cruceiro = wayside cross, embalse = reservoir, fonte = fountain, hórreo = (raised) granary, hospedaje = pensión, igrexia = church, lugar (here) = “place known as,” mosteiro = monastery, “ollo o can” = “beware of the dog,” ponte = bridge, porta = door, gateway, porto = mountain pass, port, praia = beach, praza = (public) square, rúa = street. Accommodation (in hostales, pensiones, hospedajes) is available in Negreira, Olveiroa, Cée, Corcubión, Estorde, Sardiñeiro, Finisterre itself, Lires and Muxía. There are now refugios in Negreira, Olveiroa, Corcubión, Finisterre and Muxía, all run by the Xunta de Galicia, who charge a standard 3€ per person per night. However, you should be aware that now they have started operating a fixed charge a portion of this fee goes towards public liability insurance and, as a result these refugios, will not accept any more pilgrims than the official number of beds they provide (and this ruling is strictly enforced). There is therefore no longer the opportunity to sleep on the floor or on a mattress that there used to be when the establishment in question was offficially full. With the ever-increasing number of pilgrims walking on to Finisterre and Muxía this obviously causes problems in the busy months, particularly in isolated places like Olveiroa. A private refugio has also been reported in Santa Mariña, run by the owners of Bar Antelo (on the main road) in a building next door. It is also possible to sleep in the old school in Vilaserio (no facilities). Please note that if you want to stay in the refugios you will need your credencial (pilgrim passport), normally the one you used to walk/cycle to Santiago. Note, too, that the refugios in Finisterre and Muxía are only available to those who walk or cycle all the way there from Santiago – NOT to those who arrive by bus. Food You will pass some shops and bars along the way but it is better to take at least some reserve supplies with you. Fisterrana This is a certificate of pilgrimage given by the Concello (town hall) in Finisterre to those who have completed the route and have had their credenciales (pilgrim passports, from the route they walked prior to Santiago) stamped at intervals along the way. You can make enquiries about this in the refugio in Finisterre. A similar certificate (Muxiana) is also available for those who have walked on to Muxía, whether from Finisterre or directly from Hospital, and is issued either by the tourist offfice or the refugio in Muxía. As on the other caminos a stick is very useful, for brambles, wet grass, testing boggy terrain and for frightening (but not hitting!) DOGS. Leaving Santiago 260m From the Praza do Obradoiro in Santiago and with your back to the cathedral, pass in front of the Hostal de la Reyes Católicos (on your R), go down the slope in front of its garage (this is the Costa do Cristo), then down some steps and along the Rúa das Hortas ahead. (Many of the older houses on this street have scallop shells in the stone lintels above the doors). Veer R at the end into Rúa Campo das Hortas and turn L at traffic lights to cross Rúa do Pombal via pedestrian crossing. Continue ahead down Rúa do Cruceiro do Gaio (the first of two streets in front of you) and then along the Rúa da Poza de Bar (unnamed at start); this then becomes the Rúa de San Lourenzo. 1.5km Ponte Sarela 195m The first house by the bridge has a sign “Parroquia de San Fructuoso, Lugar de Puente Sarela” (the old buildings by the bridge were tanneries and the mills used to power them). From here for the next 7km to Ventosa, in order to avoid the main road, the route is extremely fiddly, with constant changes of direction. This section, as far as Negreira is, in fact, fairly built up and industrial, but this is mainly hidden from the camino. Turn L on other side of bridge, KSO(L) at fork along the bottom of two lanes, gently uphill, and cross stream by small stone FB and stepping stones. KSO ahead uphill on other side. KSO(L) at fork shortly afterwards and KSO at crossing 200m later, uphill through a meadow. Go under telegraph wires and veer L uphill to reach minor road by modern houses. 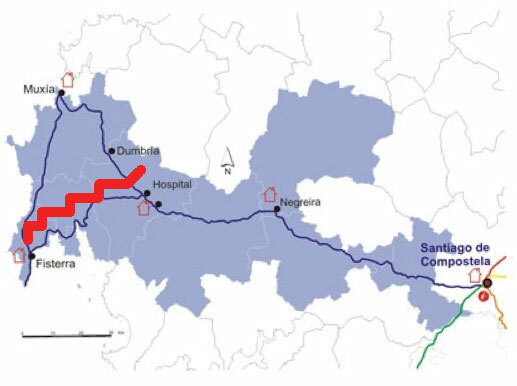 (“Casa Lauriña” to L = Casa Rural, info. welcome.) Turn L downhill (good view over to Santiago cathedral over to L on a clear day) and 300m later on turn R (by house #53) up a tarred lane uphill. 2km Piñeiro 170m Turn R in front of a modern hórreo, veering R. KSO(L) at fork, turning L and then R to a very minor tarred road. Turn L along it for 300m, crossing small river on the way then, 50m before a bigger road and a “stop” sign, turn R uphill on another minor road which then > a CT. When this > a gravelled road and turns sharp L, turn R onto track into woods, veering 2nd R on clear forest track. KSO along this, ignoring turns. Cross very minor tarred road and KSO ahead, gently downhill all the time, then KSO(R) ahead at junction. 3.5km Bridge over Río Roxos 155m Pass picnic area on L then KSO(L) at fork. 200m later turn R uphill. 500m after that, shortly after an industrial building on R, turn R when road bends L, into woods. Turn L at T-junction 200m later, along walled lane. KSO to minor road at entrance (to L) to village of Roxos. This is the Alto do Vento, 178m, bar/mesón opposite. 2km Augapesada 60m Mesón on R. Medieval bridge (recently restored), picnic area. Just before road junction (signposted “Bertamirans 3”) turn L onto paved lane past old (restored) bridge (seats) then continue onto road at “stop” sign. Cross over then turn R up uphill on other side (bar/shop 50m further on, on L, after turning) up small concrete road which then becomes a forest track. KSO at crossing (2 handy seats on R), continuously uphill. 1km Trasmonte 220m Baroque church of Santa María and cruceiro (with figure of Santiago) to L. Bar. 1km Chancela 190m Pass entrance gates (L) to large Pazo de Chancela (also known as Pazo de Capitán) and KSO ahead, ignoring turns, following road down to a “stop” sign at the bottom of the hill. Turn L, pass large statue of pilgrim (L) and then pass 2nd statue (of Minerva and the bulls) and fountain, veering R uphill (Avenida de Santiago). 1km Negreira 160m Small town with all facilities. Refugio (20+ places, with kitchen, 1km out of town (follow Camino waymarking). Hostal Mezquita, Rúa do Carmen 2 (in centre), Hotel Tamara**, Avenida de Santiago s/n (981.85.52.01, on main road to R on entering town) has special pilgrim rate (25€ single). 3km Zas/Xas 260m KSO along lane, passing tiny church (R), KSO(R) at fork, KSO(L) at next fork and 100m later KSO(R) again to end of village. Pass to L of house #21 then take LH of two grassy walled lanes at fork. This is a very old, historic route, completely overgrown and impassable till the late 1990s, becoming wider as you proceed, // to the “main” road all the time. Cross another very minor road and KSO ahead, in a straight line all the time. 1.5km Peña/A Pena 260m Bar on road (turn L, R and L by first house; simple meals. If you go to the bar you can then stay on the road afterwards and rejoin the route in Porto Camiño – see below). 2km Cornado 332m Turn L in the village then 150m later fork L uphill on earth road. At fork KSO(L) ahead till you reach a road (CP5604, KM18). KSO for 300m then turn L down lane. KSO, ignoring turns, gently uphill. At top (marker stone 50,266) KSO ahead, gradually downhill, then 150m later fork L uphill on an earth road. At a fork KSO(L) ahead till you reach a road (CP5604, KM 18). Turn R here, KSO for 300m, then turn L down a lane. KSO, ignoring turns, gently uphill. a) in good weather: fork L up track along RH shoulder of Monte Aro (555m), climbing steadily (good views as you go on a clear day). KSO at crossing 100m later, veering L (views out over reservoirs when track levels out) and veering R to junction 500m after that. Turn R then 100m later turn L, downhill, on unpaved road. Continue downhill. Part way down turn hard L. Veer R at bottom into Lago. b) In bad weather: KSO(R) on road. Views over the reservoir to R. Turn L at T-junction 1km later. Continue uphill and KSO ahead at crossing at top. KSO(L) at fork. When you reach Lago turn R at crossing in village then turn R at junction. At next junction (with road coming from back L) you will meet up with the route coming over the Monte Aro. Turn L and continue out of the village on a very minor road. 3km San Cristovo de Corzón 286m Continue on road, past church with separate bell-tower, cruceiro and cemetery, then 100m later turn L. KSO, ignoring turns. Cross bridge over small river and KSO. KSO through village (turn R for refugio) and 500m later turn L by lavadero (public clothes-washing facility), crossing small river then, at junction by telephone pylon, fork (not turn) L up small concrete road (near “main” road”) uphill. 300m later fork R onto an earth road. When you reach telephone cables fork L up another track. From here to Cée is a very nice section, apart from the two large, belching carbide factories on the skyline, the first of which is just outside the village of Hospital. The camino undulates on a wide track high up, with the mountains all around and the Río Hospital below you to the L.
1km Hospital 330m A village likely, given its name, to have had a pilgrim hospital here in centuries gone by, though no evidence remains. b) turn R for direct continuation to Muxia (27km), i.e. missing out Finisterre (see page 21). For option a) turn L and KSO on road for 600m then turn R onto track which becomes old walled lane. This is the old Camino Real, the beginning of 9km of drove road leading through the mountains to Cée, more or less in a straight line, and with splendid views all round on a clear day. Pass marker stone 27,967 and KSO. KSO(L) at fork 100m later. Cross main road and KSO on other side. Pass marker stone 26,285 and KSO. Veer gradually L and KSO on wide camino with open vistas to all sides, “roof of the world” style. The camino turns L 1km later, at marker stone 25,883. Descend gradually, reach “T” junction 1km later and turn R.
When you reach marker stone 23,508 look out for your first view of the sea here on a clear day. Pilgrims of old – especially those from central France, Switzerland and parts of Germany – would have had their first view ever of it here!. 5km Santuario de Nosa Señora das Neves 270m Small church in shady grounds (nice place for a rest), restored in 1997. The Fonte Santa, a fountain below the road to the L by the cruceiro is well known for its curative properties. A romería (local pilgrimage) takes place here annually, on 8 September. 3.5km San Pedro Mártir 310m Small chapel set in a field, with its own fonte santa (water reputedly cures rheumatism, painful feet and verrucas…), focus of local pilgrimage and another good place for a rest (covered pavilion useful in bad weather). Turn R to visit then retrace your steps. 6km Cée 5m Coastal town with all facilities and several hostales, including Hostal Vitoria, Hostal Galicia (on road to Corcubión). Hospedaje Crego (in Avenida Finisterra) is inexpensive and owner speaks excellent English. Church of Nosa Señora de Xunqueira (with Gothic section). 2km to south of Cée, in hamlet of Ameixenda on coast (in direction of Ezaro) the church of Santiago has a relic reputed to be one of the saint’s fingers. 1.5km Corcubión 12m. All facilities. Refugio in former school, run by volunteers from the Amigos of the Galician association, 1km outside the town at the top of the hill in the direction of Finisterre. Very good reports. Bar Sirena has rooms. Church of San Marcos in “gótico-marinero” style. Many interesting old houses in the town centre, whose casco antiguo – historic quarter – is classified as a historic monument. Facing church door turn hard R up some steps and up the street ahead (Calle de las Mercedes – note houses with armorial devices) to another square (Campo de Rollo). Cross over, pass to L of walled garden and turn L between houses #11 and #12 up a narrrow lane with high walls to either side. KSO(R) at fork. Nice views back over the port as you climb. Turn L, uphill again, at T-junction with wider path. At next T-junction (in front of a house), turn L onto wider track, veering R to (tarmac) road in a hamlet. Turn R uphill and emerge at junction with the main road (C552), opposite a sports ground and the refugio,at the Encrucijada de San Roque (trees, shady place for a rest, cruceiro and fountain on LH side – the Fonte de Vilar). 1.5km Estorde 50m Nice beach, campsite (Camping Ruta Finisterre, closed in winter), Hostal Playa de Estorde, bars. 1km Sardiñeiro 20m Another nice beach; shops, bars, Hostal Nicola has rooms (981.74.37.41). 18th c. church of San Xoán. Just before you enter the village, at end of section on old road, cross over, turn L onto old tarred road and then R between houses by village name board. This short-cuts a bend and then returns to the road. Cross over and fork L down Rúa do Mestre Barrera and return to road by Hostal Nicola (L). 200m later, by house # 31, turn R up Rúa do San Xoan (signposted to “Praia do Rostro” and church) then fork L immediately (Rúa Nova) and continue uphill (Rúa de Fisterra). At T-junction 200m after last house turn L up grassy walled lane uphill through eucalyptus woods. KSO at crossing 600m later and at another (marker stone 7,627) and shortly afterwards emerge with a view out to sea and “the end of the world” on the second hill ahead of you. Veer R to return to road just past a lay-by with picnic area. Cross over and continue ahead downhill and then up (quiet secluded beach 50m below you) and return to road after bend (300m later). 350m after that (at marker stone 6,484) fork L down the Corredoira de Don Camilo. This is a paved walkway, named after the Nobel prize-winning Galician novelist José Camilo Cela. It runs alongside the sea for 2km, tarmac at first, leading down to and then along the Praia de Langosteira (a beach). It continues all the way to the entrance to the town of Finisterre (2kms), ending at a viewpoint with a cruceiro and has cafés and chiringuitos (snack bars) at points along it in summer. Or, if you want, and if the tide is suitable, you can walk along the beach itself (sea water good for tired, sore, blistered feet…). When you get to the end of the corredoira (this area is known as San Roque) go up slope to wayside cross and mirador (viewpoint) and continue on LH side of the road. KSO along Calle de Coruña then down Calle Santa Catalina, veering R downhill into centre of town (port to your L). 1km Santa María das Areas 12th c. parish church of “Saint Mary of the Sands”, Romanesque in part, with statue of St. James as pilgrim in the nave. Originally only a rectangular building, several side chapels were added later, including one built at the end of the 17th c. to house the Gothic statue of the Santísimo Cristo, the focus of an annual romería. Gothic cruceiro outside and a building which was formerly a pilgrim hospital. The church also had its own Porta Santa (Holy Door) and its own jubilee years. Open 10-13, 15-19 (summer only?). Continue for 2km more on road to the lighthouse. Fountain – Fonte Cabanas – on R, halfway along). A rocky outcrop known as the “Piedras Santas,” a possible focus of pre-Christian wokship, is apparently to be found on the north shore of the peninsula. Hospedaje O Semáforo (in former observatory and morse radio station) with room (expensive (981.72.58.69) and and restaurant, Bar O Refugio. Bronze sculpture of a pair of broken boots on rocks behind lighthouse in memory of a pilgrim who drowned here in the late 1990s (remember that all this section along the sea is known as the Costa da Morte – “death coast” because of the innumerable shipwrecks in times gone by). As the weather is often misty until about midday in this part of Spain you may well have better views from here in the late afternoon and evening. Return to Santiago by bus (from the Rúa Real, next to the refugio), 3 to 4 journeys a day, more frequently Monday to Friday than at weekends. Journey time 2 ½ to 3 hours, though the service is not always direct and you may have to change in Muros to connect (immediately) with another bus. Space permitting, it is also possible to take 1 or 2 bikes. The service is operated by Monbus/Castromil and you can check the times in Santiago bus station before you leave (the information counter there has printed timetables). The continuation to Muxía ia waymarked in both directions – there and back – but economically. That is, there is only one stone at each manoeuvre, set at an angle to indicate the way to go, so you will need to watch out carefully at turns etc. The marker bollards have the shell symbol upright on this route but have no kilometre indications, simply “Fisterra - Muxía (or Muxía - Fisterra), according to where these two places are situated. Take food and water with you: the only place with any facilities are Lires (14km from Finisterre, with two bars, one with food) and Frixe (bar/shop). Note, too, that until the footbridge over the Rio Castro is ready (work is scheduled to begin during the winter of 2008) you will have to remove your shoes/boots and wade across the river (500m past Lires) via the stepping stones, This is not a problem in very dry weather but when it has been raining they will be partly or wholly submerged. It is better to put your boots in your rucksack to avoid them dangling and unsteadying you (and roll up your trousers if you are not wearing shorts) and it is suggested that you wear sandals to avoid slipping. The water is very clear and not very deep but watch out for the current, which is very strong. However, a longer, road alternative is also available and is described on page 19. 1km Padrís Turn L on road, then fork L along CT under electricity cables. This leads into the woods. KSO ahead in a straight line all the time, ignoring turns for 800m, then fork R in a small clearing along lane with walls to either side. 500m later veer R then L, then 100m after that you have two options, as the bollard indicates a RH turn but the arrows painted on it also indicate a LH turn. The RH route goes through the village of Canosa, the LH one misses it out and goes straight to Lires, nearer the sea. This (LH) option is very pleasant on a nice day but in bad/misty weather is not worth it. 2.5km Canosa Turn L again, 2nd R and then L onto concrete walled lane, still downhill. Turn L at bottom onto CT, KSO(L) at next junction and KSO(R) at the next and continue alongside a small river (on your R). At junction by a bridge turn L then 100m later turn R at T-junction of similar tracks. KSO along side of hill (// to road over to your R) then veer R to road. Turn L along it for 200m to junction with a bridge to L and church to R and turn R uphill in Lires. B. Route direct to Lires (marked, rather sparsely, with yellow arrows). Splendid views on a clear day. 1.5km Lires 2 bars (one, As Eiras, does food & has rooms: 981.74.81.80), 3 CL (“casas de labranza” – bed and breakfast): Casa Raúl (981.74.81.56), Casa Lourido and Casa Jesús (981.74.81.58). Many interesting hórreos. Church of San Estevo. Fork L at cruceiro, veering L, fork R uphill then turn L on the level by hórreo with 6 sets of “legs” (turn R here for the 2 bars and also to turn L for road option via Pontenova***). Fork R onto concrete lane and then R again, which > a walled CT, leading down to the Río Castro. Cross over via the stepping stones and veer L on the other side to the lugar (consisting of a single house) of Baosilbeiro. ***Detour via road bridge (3km longer). To avoid having to wade across the Río Castro turn L in Lires up the road to the LH side of Bar As Eiras and continue for about 1.5km till you reach the edge of Porcar by a bus shelter. Turn L here, veering L then R through the hamlet and continue to a T-junction with Pontenova (a few houses) and the river ahead. Turn R here to a bigger road and then L onto it to cross the road bridge over the river. Continue for 400-500m more into the village of Frixe (bar/shop on R, does sandwiches) and then turn L by the church. Continue ahead, downhill, veering L then R through village till you reach the end and see the LH turn to Baosilbeiro. KSO ahead here and continue as described below. 0.5km Baosilbeiro The marker stones lead you up a lane straight ahead (L), then turn R uphill at bend (to L) into woods. KSO(L) at crossing of similar tracks (not marked), which leads you to a minor road where you turn L. However in bad weather the lane may be completely waterlogged so continue on the minor road ahead of you to the R (at Baosilbeiro) as the two options join up shortly afterwards again anyway. 1.5km Frixe Bar/shop (on “main” road) 500m away, Romanesque church of Santa Leocadia (also on road)..
A. Turn R and 60m later turn up CT. This option is 2km longer and goes alongside the sea via Marineto, Figueiroa and Lourido, marked only with bollards (no yellow arrows). Info. welcome. B. Turn R on road, then turn L 500m later up wide CT, uphill, veering L and then R (very good views on a clear day). Track levels out after a while. KSO along it. Track then veers R and begins to descend, gradually. KSO(L) at fork and continue to descend. 3km Muxía Small coastal town with all facilities, founded in the 12th c. and whose main activities are fishing and bobbin lacemaking. Refugio up on hill at entrance to town (to go there directly watch out for yellow arrows on road, marked “albergue,” leading you uphill to R at start of town). Hostal Cruz (981.74.24.73) on sea-front near entrance to town. Romanesque parish church of Santa María, many interesting old houses in town centre. 1km Santuario de Nosa Señora da Barca The church’s name derives from the stone boat in which the Virgin Mary is said to have journeyed there in order to encourage St. James in his preaching and evangelising in north-west Spain. The church dates from the 12th c. and contains a large Baroque altarpiece inside, with a Gothic statue of the Virgin Mary, reputed to have been brought there in a boat guided by two angels. The Santuario is the focus of one of the most popular romerías (local pilgrimages) in Galicia, held each year on the first Sunday after 8th September. You can return to Santiago (or A Coruña) by bus twice a day, one in the early morning, the other early afternoon, with a third, later, service on Sundays. Buses leave from Bar Día y Noche on the seafront. Hospital 330m A village likely, given its name, to have had a pilgrim hospital here in centuries gone by though no evidence remains. 5km Dumbría Several bars, supermarket bank (+CD), Bar “O Argentino” (below bank) does meals and has rooms (981.74.40.51). 3km Trasufre A lot of hórreos, small church of N-S de Arantazu/Virxe do Espiño. 2.5km Senande 2 bars, shop/tabaco. KSO(R) on “main” road coming from back L to square with seats and then turn L onto minor road marked “Agrodosio/Vilastose/Casanova.” Pass turning to Agrodosio (on your L) and then KSO(L) ahead at junction marked “Vilastose” then KSO(R) at entrance to hamlet of A Grixa (marker stone 16,134). Cruceiro opposite. Pass church of San Cibrán de Vilastose (on L) and its separate bell tower (on R). Turn L on road at end of hamlet, noting house on RH corner with large hórreo (with 9 pairs of legs) on its roof(!). KSO on road then 250m later turn R onto walled lane, then L at fork 150m later, leading towards woods. KSO ahead at first crossing and at second 700m later. 1.5km San Martiño de Ozón Church with Romanesque apse, site of former Benedictine monastery. Note capitals under eaves of apses at rear of building. Pass church (shady seats – good place for a rest, fountain). KSO to end of village and after last (industrial) building on R turn L uphill. 1km later fork R uphill, steeply, then almost immediately turn R steeply uphill. KSO(R) at 2 left forks and KSO through woods. KSO. Sudden view of the sea as you descend and then a view of Camariñas across the bay. 4km Os Muiños So-named because of the large number of mills there in the past. Bar, rte, shop, Aparthotel Los Molinos (612.709.625), panadería, farmacia. 1km Moraime 12th c. church of San Julián, former Benedictine monastery. 1km Capilla San Roque Statue of San Roque Peregrino inside, with wound on left leg, angel/child and dog at his feet, hat (with shell) and stick. Fork L onto CT, pass in front of chapel (now restored) . Track > tarmac road when houses start. Reach junction and turn R. Turn L at junction 100m later, then L at fork, then fork L at last house onto wide walled lane, descending steadily. Pass concrete building and watch out for arrows on the ground 20m later, then fork L down FP (view over to Muxía, L, as you go down). Continue downhill, veering L, to continue along walled lane. This leads downhill, turns R by eucalyptus woods and reaches road by the Praia de Espiñeirido (a beach). Turn L.
a) To go directly to the refugio: fork R up grassy slope on other side of road, uphill to large block of flats at the beginning of the Rúa Infesta (not marked at start) and the refugio is in a modern building on the left. To continue from there go downhill, turn first R and then L onto the Paseo Maritimo and continue as described below. b)To continue into the town: turn R and KSO, continuing ahead when it > the Paseo Maritimo (HS/Rte La Cruz on L at start, 981.74.24.73). Fork L onto Avenida López Abente (named after a local poet) and then continue along the Rúa Real to a square with a fountain and continue ahead on the Rúa Virxe da Barca. 3km Muxía Small coastal town with all facilities, founded in the 12th c. and whose main activities are fishing and bobbin lacemaking. Romanesque parish church of Santa María, many interesting old houses in town centre. Refugio at start of town, in Rúa Infesta. I began a little late as usual, stopping for coffee and pastries in the town. The Camino left town and then began to go its own way away from the road. It began by going through a forest, and through small farming communities. Dogs would always be the 1st one's to hear me, but they have never been a problem. It seems their bark is bigger than their bite! The next hamlet I passed through was Lavacolla. This was where the pilgrims would have a good wash before proceeding on to Santiago. Then another 6 kms to Mount de Gozo (Mount of Joy), here the pilgrims would finally see Santiago and possibly the Cathedral, for the 1st time. Unfortunately large trees and other buildings obscure the spires of the Cathedral and one has to wait a little longer. Finnisterre. This is what the pilgrims did in the Middle Ages. Finnisterre was seen as the end of the known world, and pilgrims would go there, get rid of their old clothes (symbolizing their old life) and begin the journey of life again. But more of that journey tomorrow. I finally made the Cathedral, 1st in the distance and then upfront. I did not see the main entrance but will come back to the Cathedral and the sights of Santiago when I return in 3 days time. I went to the Pilgrim's Office and was given my signed certificate with my name on it (written in Latin!). I met 4 others on the track or here who were also arriving today, 2 of whom are continuing on to Finnisterre. Then to two tourist information agencies, one for Galacia (the region I am in) and one for Santiago. They also helped me with accommodation. After a bit to eat, I finished this diary and went to bed. Sightseeing can come when I get back to Santiago. Although many places with accommodation and food are given in the guidebooks, in winter only the main towns can be relied on, and they are quite some distance apart. I am also doing a bigger distance today so I can make Santiago by tomorrow. For the 2nd day it has been raining on and off. We're passing through mainly farming areas. There's a lot of farming equipment to be seen. Besides farming, forestry is also important and one meets a lot of trucks carrying logs. In the entire day I only found 2 places open for food. One was a bar full of caps across the ceiling and walls. In the other cafe, there seemed to be a small family gathering. I was beginning to realise that I was behind time in my plan to get to O Pedrouzo, which I was told was the last big town after Arzua. Last night I had followed the road for 15kms, this time that was not possible, yet the Camino was very slow also today. As a result I was beginning to again walk in the dark. I passed a corner where someone had stopped to turn in the direction I was going and asked their help to the next town which they gave, meaning I arrived O Pedrouza just after 7pm rather than possibly 8pm. It was a time out call, being sensible, rather than putting myself and motorists in danger. I had trouble finding accommodation. When I eventually did, I was ready for a good sleep. Unfortunately the wifi did not work in my room so I was not able to give any updates. I did meet a South Korean couple who were doing the 102 kms Camino. They only had time for that much. Nice couple.